A barrel ceiling in the master bedroom is both pretty and practical, lending height and depth to a modest-sized room. Doors and screens in the glass sitting room are designed to slide completely open to let the outdoors in. The stones in the fireplace surround, chosen to match those on the beach out front, dictate the living room’s earth-tone palette. Visitors arriving via the front door can see clear through the house to the water. A cupola, which opens into a hallway, adds a nice architectural detail and lets in light, while an exaggerated stone chimney helps ground the house. .” Copious windows enable the owners to take full advantage of the water views. The house presents a classic, simple Georgian facade in keeping with its New Canaan location. The large pool, a tennis court, access to a neighborhood pond, and a big yard for playing attracted the couple, who have three children. 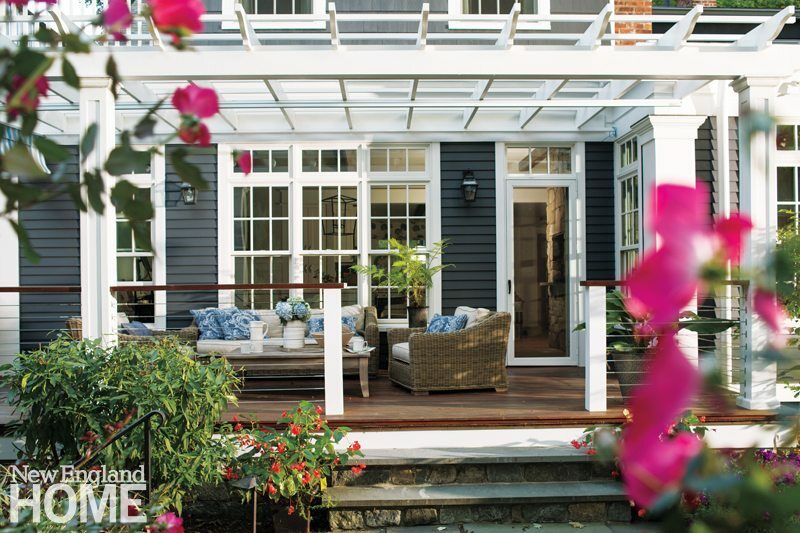 An expansive rear porch offers plenty of space for warm-weather entertaining. A slew of Williams Sonoma pillows in a host of summery blue tones raises the living room’s comfort level, while a glass top enhances the dining table’s practicality. Leather-bound books and an antique copper boiler add to the hearth’s charm. The handsome rug pulling it all together is from Ballard Designs. To create a lighter atmosphere for the living room, designer Patricia Lapierre removed the doors that once enclosed the lowest part of the shelving and brought in beachy accessories. She also embellished a small upholstered chair with nailhead trim, upping its character tenfold. A bar tray holds entertaining essentials at the ready. 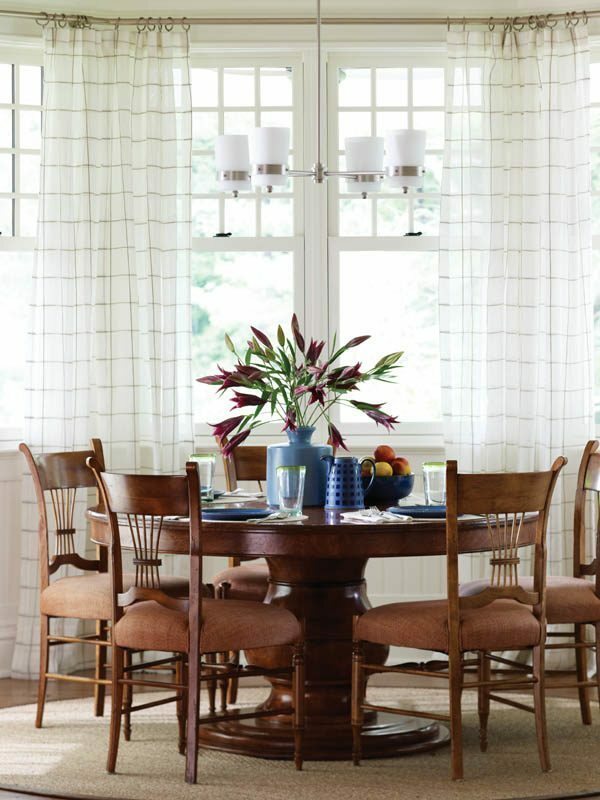 A sisal rug defines the sunroom’s dining area. Cheery curtains make a colorful frame for the view. To update the existing outdoor furniture collection, Lapierre had the pieces repainted and outfitted with new pillows and umbrellas. The master bedroom’s dream–inducing horse photos, bed linens, and reading lamp are from Ralph Lauren. Fresh bouquets throughout the cottage keep the rooms connected to the outdoors. Walls painted Benjamin Moore’s Bunny Gray soften the guest bedroom. To introduce a note of texture, the standing lamp wears a burlap shade. “Small rooms can be cozy,” says Lapierre. In the living room, accessories from Ralph Lauren Home lend an antique chest fresh personality. Less than two decades old, this classically designed colonial home in New Canaan offers no hint of the redesign from the front. The conservatory doors open onto a stone patio and fireplace. A small deck off the master bedroom sits above the sunny passage between the kitchen area and the wet bar. The children’s bedrooms (above center and right) illustrate the casual comfort vibe that the homeowners and designer were going for. The master suite blends an urban sensibility with a warm country feel. Keeping it neutral was an important part of the design strategy. A hand-painted chest custom made in Thailand serves as a bar. New windows with transoms let the sun wash the living room, and wide-plank white oak floors were laid throughout the house in a renovation that honors the original but has a fresh feel. A cozy deck off the breakfast area (the new owners added the pergola). The breezeway connects the barn and main house. The property offered the whole country package, including the farmhouse with its classic colonial facade. The homeowners were living in Brooklyn, New York, and had never heard of Westport until they started looking for a home for their growing family. They were sold after one look at this iconic farmhouse on lovingly tended, parklike grounds. A half-wall and columns separate the large living room into two more intimate seating areas. Symmetry defines the front of the Shingle-style house. n back, symmetry gives way to interesting roof lines, a turret, porches and a fieldstone chimney that serves four fireplaces. Porches, like this favorite spot for morning coffee, are deeper than the standard. Casual comfort reigns in the more rustic family room. A nook in the master suite provides a cozy spot for relaxing. Over the years, the 1840s Federal-style house had been given a mansard roof and Victorian flourishes. Grassi designed the houseâs curved doorway. The exterior brackets on the tower addition match those flanking the back door. The living room plays out a simple, neutral palette with a black-accented vie. A deep Jacobean brown stains all the floors. The marbleized globe ceiling fixture was brought in from the front porch ceiling. Round and oval ornamental windows add interest to the house’s front facade. Interior designer Nance Vigneau styled the intimate living room with a monochromatic beige-and-tan color scheme. 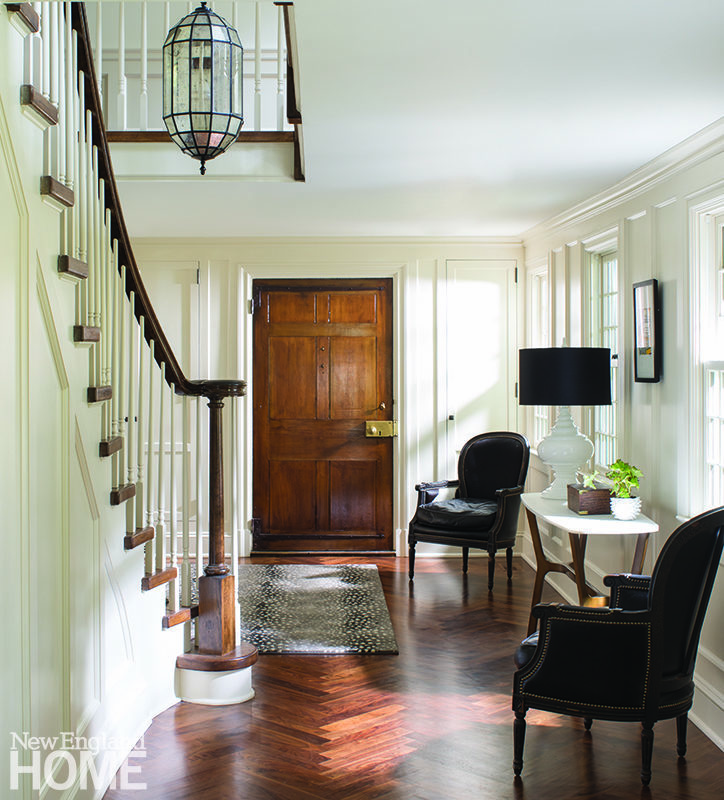 The paneled wall underneath the staircase landing encloses a small powder room. Some of the bookcases architect McKee Patterson designed wear a cover of ornamental wire. The terrace, with its large barbeque area, outdoor dining space and stone fireplace, connects the main house and cabana. The back porch sprawls across the living room, family room and kitchen with their spectacular views of the harbor beyond. A rough-sawn oak timbered ceiling lends the kitchen and adjacent sitting area a rustic look. The master bedroom boasts a variety of soft colors and sumptuous textures, from the velvet headboard to the quilted bedding. An antique tea table resides between the master bedroom’s velvet-covered chairs. Antique prints enliven a sonâs room. The pine chest holds keepsakes. The foyer’s curved wall lent itself to the Scenes of North Americaâ wallpaper by Zuber, a paper also found in the White House. A figurative painting by Volpone hangs on a mustard-colored wall in the artist’s study, which also holds a custom Parsons-style desk by DLF Contractors. A Venetian carved Bernini bed with parrots perched on the posts dominates the master bedroom. After admitting that her family room “just didn’t work,” Volpone took Hirsch’s advice and replaced a small coffee table with a large custom-designed painted table to better anchor the room. Twin sculptural lamps help define the room’s -sitting area. Dranow carved out a restful sitting nook in the large living room. True to her artistic roots, Rachel Volpone fills her home with bold, colorful combinations of her own art and the creations of artist friends that range from painting to sculpture to photography and more. Splashes of vivid color were a must for Volpone. The welcoming 4,000-square-foot, shingled house incorporates timeless features like a port cochere. With subtle gold and silver accents and a cozy sitting area, the master suite is a soothing retreat for the homeowners. Detail of the master bedroom sitting area. The designers incorporated indoor/outdoor fabric on the sofa and ottomans in the TV room, making them family- and pet-friendly. An oversize walnut coffee table with sculptural legs anchors the large family room. 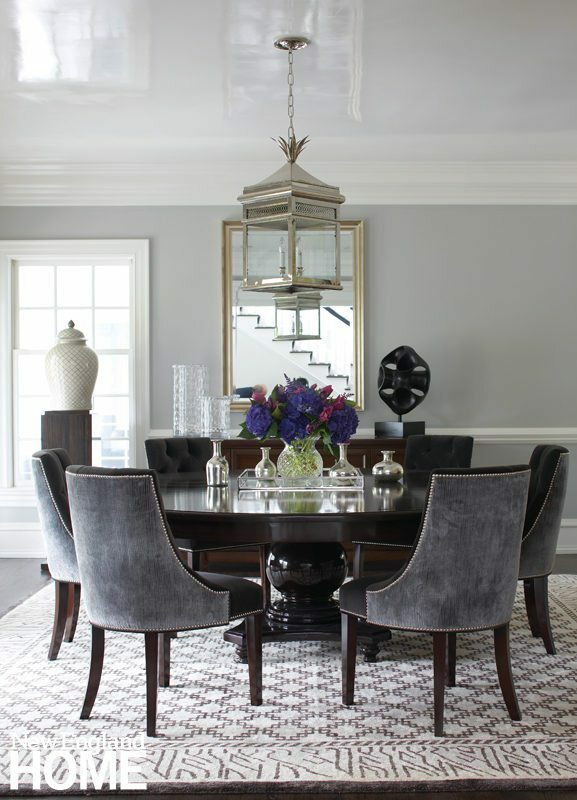 An elegant chandelier paired with a more transitional table bridges formality and functionality in the dining room. In the master bedroom, the walls and ceiling wear the barest whisper of lavender. The husband’s love of rich color is addressed in the dining room with its blue grasscloth walls and blue-velvet chairs. A side entrance opens to a spacious mudroom with plenty of storage options. In the family room, the designer satisfied the wife’s penchant for neutrals by washing the space in shades of taupe. Pops of purple and a fiery painting brought back from Italy add a little kick to the living room’s palette of soft grays. Silvery chairs frame a view of the sofa and a sculpture in the window overlooking the front lawn. A smoky-colored Phillip Jeffries wallcovering and a soft Merida rug enhance the master bedroom’s cocoon-like ambience. So classic are the lines and materials of this Shingle-style waterfront home in Greenwich, it’s almost hard to believe it was only recently built. Camel, navy, and cream are colors a young boy can happily grow along with. 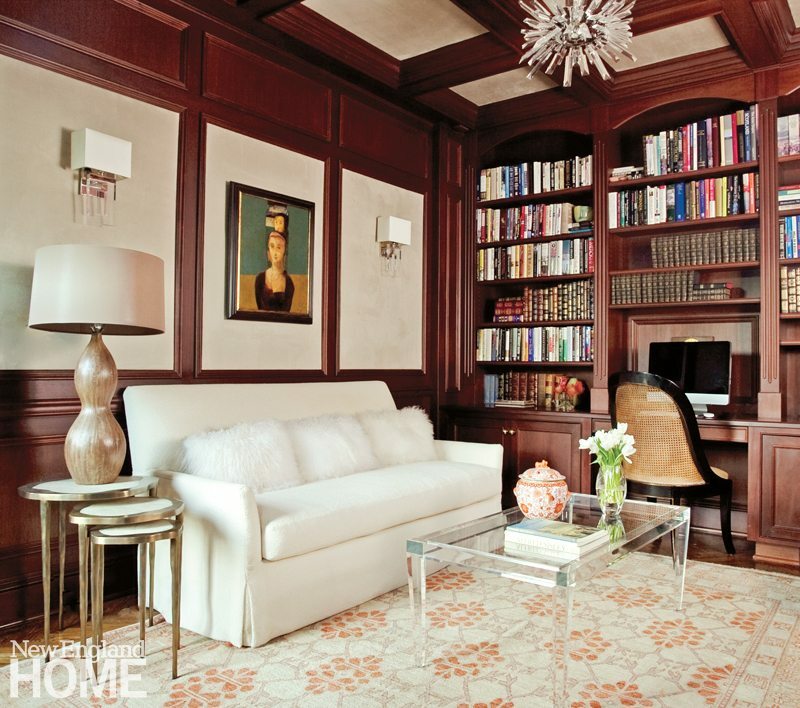 A contemporary chandelier and an acrylic coffee table are fun contemporary notes in the paneled library. The rug adheres to the owner’s preference for elements that incorporate warm and cool colors, while the Osborne & Little sofa fabric speaks to the pale suede wall panels. In the family room, Julian Chichester shelves provide a home for a growing collection of books and mementoes. In addition to providing light, the stylish metal lanterns hanging from the ceiling help unify the space. The living room’s polished-metal mirror adds another jolt of interest, as does the sculptural lamp. The living room features seating design by Scalo. The home’s classic architecture serves as a timeless backdrop for a beguiling range of styles and eras, beginning with the entry’s vintage sconce and Oly chest. "Timeless but also livable and fresh," is how designer Lynne Scalo defines the elegant living room and its medley of handsome textures. Silver sconces flank a piece of contemporary art, while a more classic painting and a rustic mirror hang nearby-a perfect example of the designer’s keen eye for mixing and matching. With its pale blue walls and plush cream wool chaises, the sitting area in the master suite is an oasis of calm. Griffin-Balsbaugh custom-designed the natural linen chaise, chairs in crushed velvet and glazed linen and faux-leather ottoman. The family often dines at the kitchen table, where large windows overlook the New Canaan Reservoir beyond. Coffered ceilings forge unity between the family room and kitchen. Velvet roman shades and an upholstered headboard add a plush note to the master bedroom. Classic and modern elements mingle in the dining room chandelier. The dining chairs wear an easy-to-clean Sunbrella velvet. The brass-and-glass tableâs shape is a perfect match for the tufted dining chairs. Restful aqua mixed with neutrals forms the palette for the main living spaces. The libraryâs dark wood paneling was lightened up with a coat of luscious butterscotch-colored paint. Designer Michelle Morgan Harrison brought drama to the living room with a wall of antiqued mirrored panels and glamorous materials like the silvery white sofa fabric and the combination of a silver-and-white patterned fabric from David Hicks and a metallic linen from F. Schumacher on the chairs. A breezeway connects the house with the garage. The screened porch, another nod to rural life, is a lovely place to spend some twilight time. The master bedroom is all architecture and serenity. 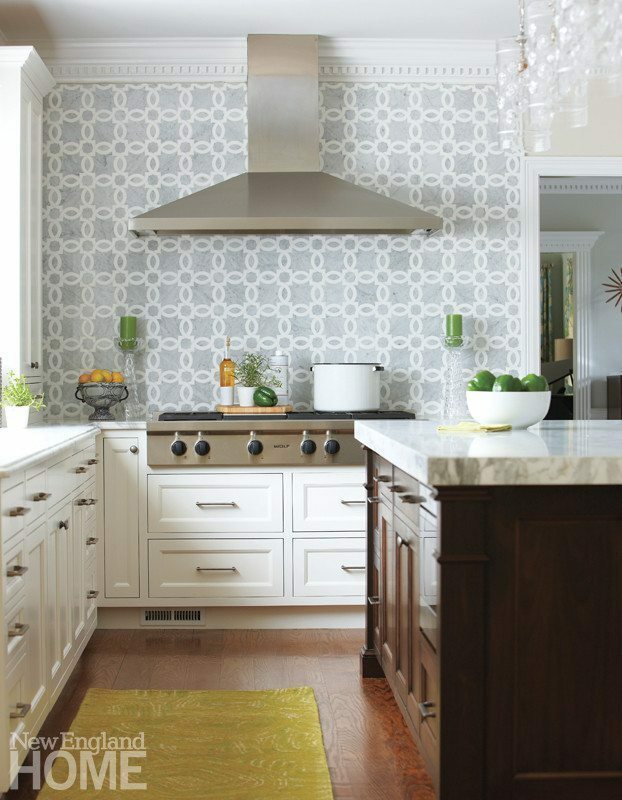 A built-in kitchen alcove repeats the colors and patinas found throughout the house. The new home's shape says "barn"; while fenestration and amenities speak of the comforts of modern life. Gentle wood patinas and the colors of nature suit the dining room. Davis says she chose materials that look as though they belong here, as in this cozy retreat behind the living room. Davis and Owens designed the rectangular steel fireplace surround and log carrier. The resurrected old Dutch barn already had the lofty heights and massive oak beams with a patina only time can impart.